POSTS Fitness Gear Dumbbells Review - Which One's Best For You? Fitness Gear Dumbbells Review – Which One’s Best For You? Working out from home is becoming easier than ever. Companies are manufacturing tons of cardio and weightlifting equipment that could be the perfect addition to your home gym. It saves you money and time. Fitness Gear’s dumbbell selection is fairly limited; however, the options they do have could fit your needs. The Fitness Gear Cast Hex Dumbbell is our number one choice. It’s constructed out of the toughest material, meaning it will last you for many years to come. Are you looking to lift some weights alongside your cardio routine? It adds some variety to your regular routine and can help you lose fat and build lean muscle too. Before continuing, I must mention that the Fitness Gear Dumbbells below are available in a variety of weights. Therefore, I’m going to focus the review on how the dumbbells are built and what customers are liking and disliking about them. There are lighter weight options for those who are new to lifting weights. However, as you progress, you have the option to purchase heavier dumbbells. 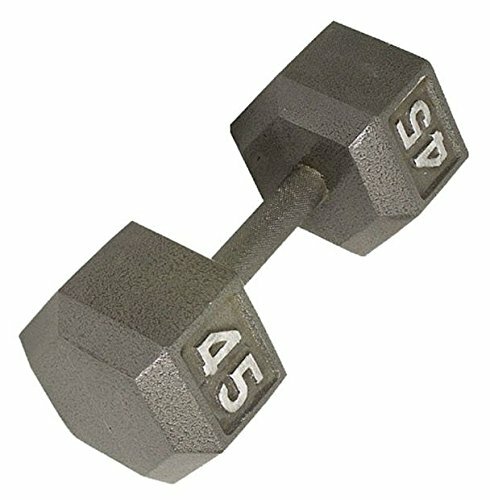 When you’re looking at the dumbbells by Fitness gear, you may assume that they come in pairs. However, this isn’t actually the case. For the following section, it’s worth keeping in mind that you only get one dumbbell for the first two picks. If you wanted to use more than one, then you would have to make multiple purchases, however as many as you would like. What makes the Cast Hex Dumbbell our number one pick from Fitness Gear? The construction and overall durability of this dumbbell is unparalleled. The company have used incredibly strong cast iron materials that make the dumbbell extremely resistant to all kinds of wear and tear. 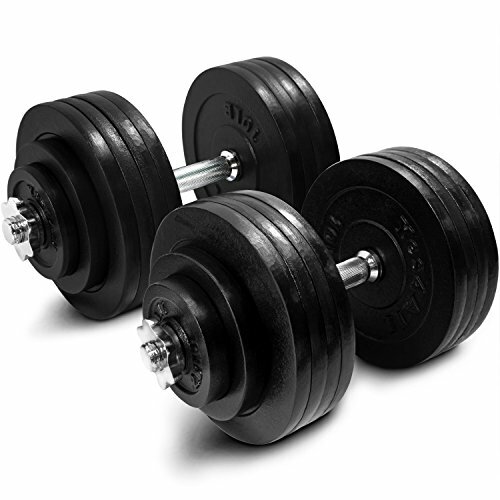 A common complaint among people using weights from home is that dumbbells are prone to a lot of wear and tear. You can feel confident knowing that the cast iron construction will make these weights last for years. As far as dumbbell costs go, this one is priced very fairly. In fact, it’s a fantastic price, considering how durable it is. Another beneficial feature I noticed is that the Cast Hex Dumbbell is extremely well-balanced. There’s nothing worse than trying to lift a dumbbell that feels heavier on one side than the other. 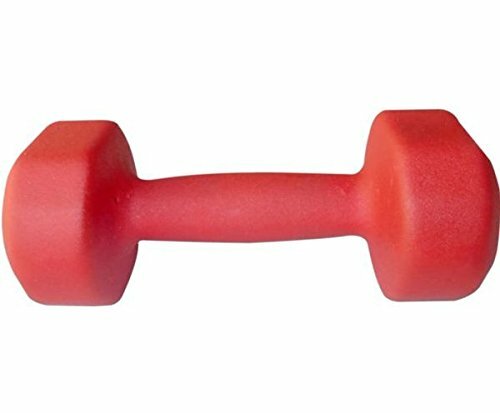 The major flaw that customers are noticing with the Cast Hex Dumbbell is the handle. They are feeling a little let down because it can become slippery very easily. While working out, your hands are going to sweat, and worrying about the dumbbell slipping is not ideal. If you know you get sweaty palms while lifting, you may want to get some workout gloves to ensure the dumbbells remain stable. I recommend these Trideer Workout Gloves for extra grip. Others would also prefer the handle to have some kind of rubber material. The handle is a similar material to the dumbbell itself, and it can feel too rough for some users. While the construction of the dumbbell is built to last you years, the finish hasn’t quite been designed with the same approach. After some time, you may begin to notice the outer coating begins to rust which reduces the aesthetic appeal. The cast hex materials also mean that dropping these dumbbells on your floor can lead to damage over time. However, this can easily be remedied by placing workout mats on the floor, but it’s a bit of an extra hassle. I recommend these ProSource workout mats. So, the Cast Hex Dumbbell was our number one choice due to the robust construction and great price. But how do some of the other dumbbells by Fitness Gear compare? They have a variety of dumbbells on offer. I liked how the company gives you a selection to choose from as they each have their unique uses. To learn more about their other dumbbells, take a look below. The Fitness Gear Rubber Hex Dumbbells are an excellent choice if you’re concerned about preventing your floor from being damaged. There’s a rubber coating around the outside that acts as a protective layer. If you accidentally drop the dumbbells onto your floor, you don’t have to worry about it causing a lot of damage. This is one major benefit over the Cast Hex dumbbells. As far as the handle goes, people are loving how it feels to hold. This is because there’s a thin layer of rubber around the handle that makes it more comfortable to grip. It also reduces the severity of calluses. 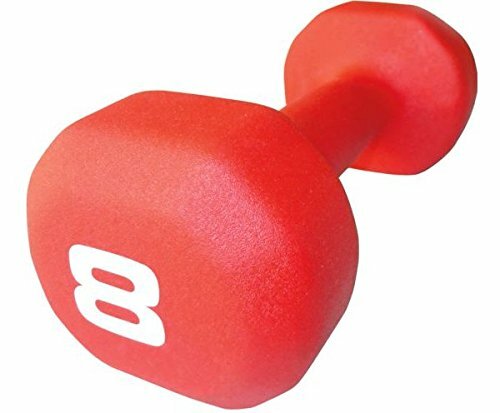 I found that the core of this dumbbell is made of cast iron, so it’s similar to the Cast Hex range, however, this can work against its favor. Unfortunately, the Rubber Hex Dumbbells can’t compete with the Cast Hex ones in the durability section. Various customers have experienced one very similar problem. 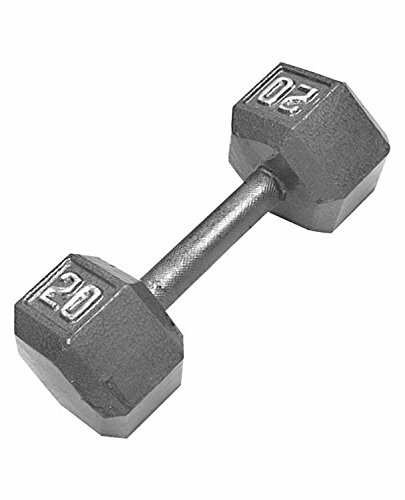 One side of the dumbbell weight is prone to completely falling off after being used over period of time. While the handle feels very comfortable, the overall stability doesn’t feel so great for some customers. Since it has extra rubber material on the outside of the cast iron construction it causes the dumbbell to feel a little loose. This can cause some issues as some customers don’t feel completely stable while lifting them. The instant standout feature to the Fitness Gear Neoprene Dumbbells is how comfortable they are. This is due to the neoprene material which makes it incredibly easy to grip. Not only is it better to grip, it also feels more comfortable. Therefore, you can focus more on your workout than worrying about the callouses on your hands. If you want to add a bit of color to your workouts, these Neoprene ones are superior over the other two choices in that category. Once your hands start to get sweaty in the workout, the Neoprene exterior grips to your hands for a firm feeling. I also appreciated how the Neoprene range of Fitness Gear Dumbbells offers more purchase options. Instead of having to buy multiple items, you get two per order. They are best suited for weight lifting newbies or people looking to get some muscle activation with lighter weights from their workouts. Initially, I thought these dumbbells would be pretty durable due to the iron interior. However, after digging deeper into the research, I realized this wasn’t true. It turns out, the weights on either side of the handle are not connected as securely to the handle as I would have expected. I believe this one of the flaws of the Neoprene material. It’s awesome for providing a comfortable grip, however, since it’s molded around iron, it can feel unstable. The maximum weights these Neoprene Dumbbells go up to is only 20 lbs. This may be enough for some, but for most people, they’ll outgrow these weights pretty fast. Are you on the fence about working out with dumbbells from home? Now that you know more about that Fitness Gear’s Dumbbells have to offer, you may want to consider whether using dumbbells will benefit you. The biggest reason to use them is to build muscle and strength. Although, the three dumbbells above may not be the best for more serious lifters, they can certainly be a worthy addition to your home workouts. Those looking to lift heavier weights from home would prefer adjustable dumbbells where you can add and take off weight as you please. If that’s what you’re after, I’d recommend the Yes4All Adjustable Dumbbells. Incorporating dumbbells into your workouts adds an element of variety. If you’re getting bored of your standard cardio routine, using some dumbbells would be an excellent way to keep your motivation high. All in all, the dumbbells mentioned in this review will be awesome for gaining lean muscle along side your cardio workouts. However, I cannot recommend them if your sole purpose is to gain lots of muscle mass. They can give you a good start, but you would be better off going with the adjustable range as I mentioned just above. There’s more options to build up the bigger muscles in your body with the heavier weights. Our best choice was the Cast Hex Dumbbells due to how incredibly durable they are. The construction means they can be a one-off purchase that will remain strong after years of use. They also have heavier weights available. The Rubber Hex Dumbbells feel more comfortable to use and are best if you’re worried about minimizing any floor damage. However, they tend to break easier and can feel unbalanced while lifting. Lastly, the Neoprene dumbbells are the most comfortable ones that provide some color to your workouts. But their max weight is 20 lbs, so they’re for more casual lifters and newbies. Customers also say they don’t feel as stable as they would like. 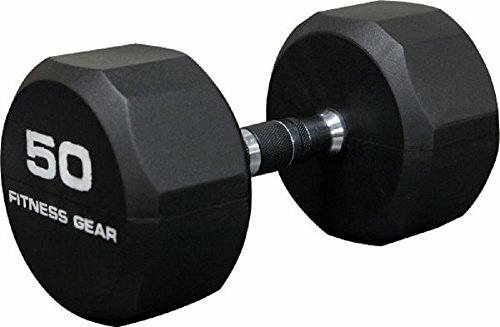 The dumbbells on offer by Fitness Gear that I’ve just reviewed are all available at great prices. It’s also worth keeping in mind that you can add more dumbbells to your collection over time – so you don’t have to splash out on an entire set straight away. Hopefully, I’ve given you all the information you need to make the best choice on whether any of these dumbbells would fit your needs. Take all the pros and cons that I’ve detailed for each product into consideration to help make your decision process as easy as possible.